Our Patented utility bag, known as the “Freedom Security Bag”, is made of durable high quality, transparent poly vinyl chloride (PVC). The main and front compartments are double zippered with zipper pulls attached for ease and convenience of opening and closing. An adjustable shoulder strap is for carrying purposes. 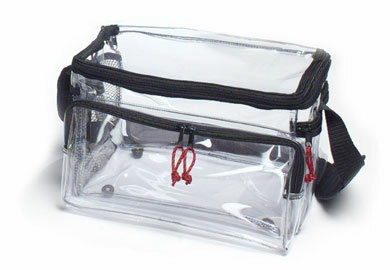 It also features a mesh pocket on one side for holding beverages and a vinyl zippered pocket for loose change, keys and smaller items on the other side. Dimensions are 8”H x 12”W x 7.5”D. 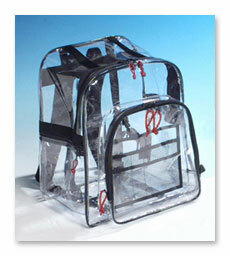 The durable transparent large back pack stands at 17H x 14W x 12D. 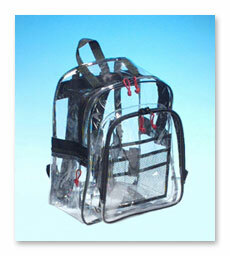 This bag is the perfect size for carrying schoolbooks, even if transparent backpacks are not mandated. By visualizing what you are carrying, you will never leave behind a book at home. An inside mesh organizer allows you quick and easy access to your pens, pencils, calculators, and whatever else you are carrying!!! 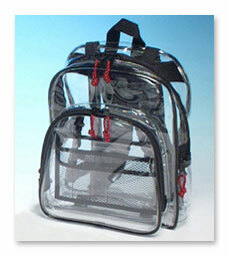 The backpack folds easily to fit in all size lockers. It's also great for storing gear for camping trips or for personal carrying needs. The adjustable, heavy duty, double strapped shoulder harness allows you to carry your belongings with ease. * backpacks and bags available with custom design capabilities. Our versatile fannie packs with multiple zippered inner compartments are ideal in the warmer summer months where pocket space is limited. 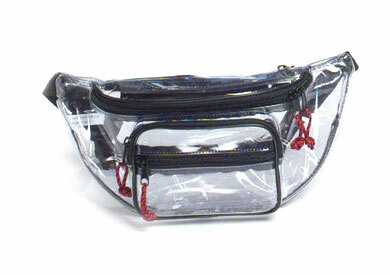 Simply place your keys, wallet and loose change in the pack, strap around your waist, and away you go!!!! 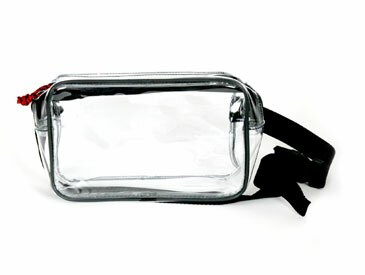 Our promotional sized fannie pack is great as an inexpensive giveaway. These are great for events such as fan appreciation days, sponsored promotions, and any other events that call for an affordable gift solution.